A total solar eclipse occurs only every 1-2 years, and to witness it in Antarctica is without doubt a rare occurrence. 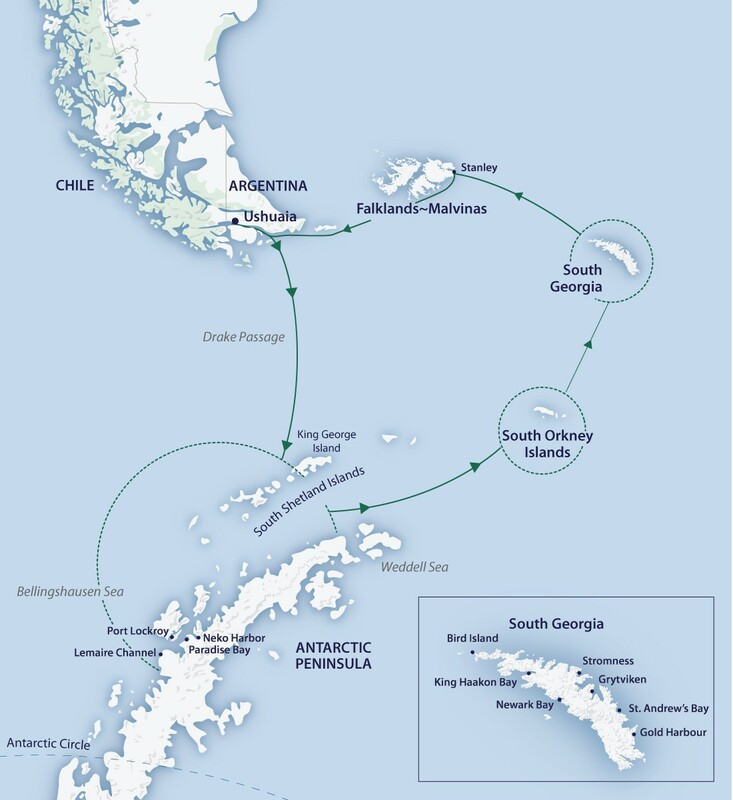 On this unique voyage, you will visit Antarctica and experience the incredible white continent in late spring, photograph glistening icebergs, witness thieving Adélie penguins stealing one another’s stones during nest-building, and orca whales hunting in packs. It’s a wonderful time to kayak and to snowshoe while the show is still pristine. This morning, if weather permits, we set course for Elephant Island, a half-submerged mountain cloaked with an ice sheet at the outer limits of the South Shetlands. We’ll learn the story of Shackleton and hear how his ship, the Endurance, was crushed in pack ice in the Weddell Sea, before him and his men climbed into three open boats, spending 16 months at sea, before finally making landfall on this tiny toe of rock and ice in the vastness of the Southern Ocean on 14 April, 1916. We plan to sail past Cape Valentine to see the beach where the men first put ashore over 100 years ago. Weather permitting; we hope to follow the coastline 9.65 km/6 miles west to Point Wild, where the men eventually set up camp under two of their upturned open boats and some old tents. If weather permits, we’ll attempt to make a landing on historic Point Wild, Elephant Island. We then begin to position our ship in prime location for the eagerly awaited solar eclipse. Located 477 kilometres/296 miles east of southern Argentina, the Falklands~Malvinas are a unique mix of wildlife hotspot and inhabited outpost. An archipelago of over 700 islands, but consisting of two main islands, East and West, only seven of the islands are inhabited. The cold nutrient-rich waters surrounding the islands makes them a prime location for marine life including seabirds and seals. Our time in the Falkland~Malvinas includes a short walk in historic Stanley town, and Sealion Island located in East Falkland’s south, where you can get insight into the unique experience of Sealion Island Nature Reserve. You will discover how the raw beauty and solitude of the island makes it a haven for wildlife and visitors alike. In 2009, Sealion Island was officially declared a National Nature Reserve, with no introduced predators living on the island. Tussac grass covers much of the island providing an ideal habitat for elephant seals and sea lions that can be found on many of the island’s spectacular beaches. A plethora of birds such as thrushes, finches, tussac birds and Magellanic penguins also inhabit the tussac. Pods of orcas, Peale’s dolphins and leopard seals are regularly seen in the waters around the island. The island’s southern giant petrels, with a wingspan of two metres, act as a welcoming party to ships as they approach Sealion Island. Rockhopper, gentoo and Magellanic penguins come to Sealion Island to breed. Macaroni, king penguins and Striated and Crested Caracaras are also common seen on the island.